By how much can the signalling paradigm stymie new leaps? Bryan Caplan argues that simple innovations can be undone and ignored by the human need to fit in. The need to conform, indeed the positive desire to conform, and the clean emotional hit you get from conforming, can, in Caplan's words, 'lock in' the status quo. But there is good conformity and bad, and you can conform to good or bad paradigms. In their own matrix, a gang member knocking on the head of an enemy is as conformist as an elderly aunt plodding to Church. And once the paradigm is laid down, it is quite easy for an eloquent outsider to mould it to his end. Artur Baptista da Silva, a man who suddenly appeared on Portuguese TV as a regular economic expert, caught the conforming current, and even though a 'fraud', was able to amass some fame within the system by playing to the present message, and what was wanted. The bad parts of conformity do need to be challenged, because quicker and easier ways to share and multiply elegant innovations are one of the main drivers of under-the-temple progress. How does the jettisoning of worldly goods fit into the status-striving paradigm, and is a monks habit as much as signal as cloth of embroidered gold? Status, let us not forget, has been proven (see) to be quite independent of possessions, and in the limit can revolve around an aura of personality. Fame, for example, is as much a currency in this world as money, and the fact that there is a link between the two is irrelevant - the former is a silkier medium of exchange. When one considers St. Francis of Assisi, then, as exemplar One of Christianity Lived, the below-ground currency must be checked as well. Hard to make out from this vantage, but the flame of fame must have carried on its tail some kind of worthwhile hit. And I don't know how to psychologically interpret the stigmata. Narnia, the jumbled, beautiful, mishmash of a world invented by C.S. Lewis, has acted as neat segway for a generation of writers to a reality beyond the too-easy padding of modern childhood. A dangerous yet cosy dimension where moral choice carries a greater immediate weight than at home, it is at heart a world of simple consequence that children can quickly latch onto. It is also, to those who follow the trail closely, a sometime religious allegory, with winks to this or that parable thrown in at random intervals. The structure of the seven books that make up the chronicles has even been tethered by one researcher to the seven heavenly bodies of Medieval cosmology, for those who dare go even deeper. But it is the overt religious aspect that can sometimes trip readers who unwittingly read them on face value as a child only to find in adolescence that Aslan is an allegory of Christ. In the case of Laura Miller, a writer and critic for Salon, the discovery that Narnia was vaguely underpinned by the old religion, or at least its tawny exiles, was a crisis event, and the subject of this book. Introduced to the books by a knowing teacher who sensed in her student a need for fantasy, Miller devoured them whole, and was drawn in particular to talking animals and the possession of a secret universe of her own. The soft unconscious finger with which Lewis gestures into the world, the simple down-to-earth language, the common sense rumble of the place, and the high adventure, all serve to give a real, vivid texture to Narnia, and even impart practical advice to children. In her teens Miller uncovered the Christian shadow under the text, and it is angry wrestle with that discovery that forms the core of the book. But before I get to that, I want to stress that this book is special. Simple and special. Only a number of times in my life do I recall reading a book with a similar reward ratio, that had a closer number of insights or emeralds per page. It is one of those odd books that you really don't want to finish. I would pause mid-paragraph, go and make a cup of tea or do something else, not because I was bored, but because I wanted to savour and consider what I had just read. And she knew it. On the central struggle between the Christian allegory of the books and her own desire for an unblemished childhood Narnia, Miller resolves it as follows, finding 'The Other Way In' by looking in more detail at the genesis of Narnia. She visits Ireland and Oxfordshire and finds a Narnian twinkle on the landscape, investigates the debate between Tolkien and Lewis on the meaning of myth and fairy and their correct allocation, and into the medieval romances that so entranced Lewis, and finds that such an elegant cacophony went into the books that the Christian thing is really one of a hundred others. An important part, for sure, but still a wayward traveller on the 'bonny road to Elfland'. And in considering her childhood reading from afar she sees many benefits that fruited later on, in particular the ability to read ironically, morally, and allegorically. And the discovery of a nice wardrobe to wildness. (Reward ratio = reward per moment/effort per moment). Stepping into The Hobbit amidst the weird haze of bad words and cold commentary, I was expecting an elongated, excessively padded BBC TV movie illumined by epileptic and nauseating frame rate detail. Fate, however, led me away from the controversial 3D version, and into simple cinema 2D. And I enjoyed every minute of it. This, then, is a review of the easy version that most people will watch, avoiding in turn the distracting presentational conflict dominating the chatter elsewhere. I speak as a sometime Tolkien apologist, but never a massive connoisseur of this children's story, finding it a bit schizophrenic in tone and with too many characters. Although in reality I may simply have tackled it too old. As with the Lord of the Rings, Peter Jackson does a great job of combining the twin strata of homely English shire-land and Norse-inflected grandeur that forms Middle Earth, a tough task to execute well. The problem of introducing 14 dwarves was handled well, with a humorous generic personality quickly affixed to each in order to avoid confusion - a proven strategy. And Bilbo, oh Bilbo. Skeptical at first of Martin Freeman, due to the disappointment of Hitchhikers Guide, I was happy to find that he plays the little Hobbit with perfect self-depreciation and simplicity, grounding in turn the whole story. The longevity of the thing (170 minutes), has annoyed some, but each scene added more than enough value to keep me engaged, and never tired or bored. This is quite unlike a number of other extremely long movies. The trick, I am coming to see, is in the ratio. For long movies, or indeed any form of narrative art, interest can be sustained if the reward one gets for paying attention and engaging are greater than the effort required to keep up. But it is even more precise than that, because the ratio is in operation moment to moment, and can act cumulatively to heighten the bliss or boredom. The Hobbit had a high reward ratio, with each scene offing a nice and self-contained level of enjoyment. I am aware that part of my appreciation drew from not having to follow the narrative too closely, because I knew it already, and thus could savour each scene in and of itself without worrying about the greater whole. But that is an achievement on its own. Reward Ratio = Reward per moment / Effort per moment. The Hobbit had a reward ratio of around 4. Very low effort per moment, high reward per moment. After Archduke Ferdinand succumbed to a reckless bullet it took less than a half decade for his farytale empire to fall apart. The European Union and its more careless tentacles can sometimes be confused with a soft-form update on the wandering ghosts of Augustus or Wilhelm, and the Euro its zenith. The Austro-Hungarian Empire was, as its name suggests, not a nation but a collage of nations all under a kind of split monarchy. For most of its history it did not have to deal with democracy in modern form, although fealty had to be paid to the clever elites of whatever group happened to be shouting that day. To Hitler, the Empire was an example of what happened when ethnic mixing co-incided with a light or nonsense political structure, and his anti-semitism was kindled in multi-ethnic Vienna, where he saw in the apparent bedlam an opportunity. To foreign crowns of all stripes and shapes it was a confused and flailing peacock waiting for a push in one direction or another. And never was it what could be described in textual form as a nation, its strictures and structures a combination of Pale Fire's 'distant northern land' and Castle Gormenghast. But then again, it seemed to plod along quite well for nearly a millenium, so must have had something going for it. In comparing it to the EU, and its medium of exchange to the euro, one has to be soft and deft footed, because it survived and traded and haphazardly grew for a very long time, and was only sundered by a grave external event, and the fate of the EU is still dim and hard to make out. And also to note that for many ethnic groups the Empire formed for them a clear identity, not the jumble it appeared to outsiders, and they subscribed to its (cultured) flag. Sigmund Freud and the writer Joseph Roth both lamented its passing as a personal tragedy. As Freud said, 'I do not want to live anywhere else... I shall live on with the torso and imagine that it is whole'. A cultured elite can come to defend and rely on a vague multi-national polity, and that is no bad thing. A harsh segment of modern economics emerged from its dusty gold-leaf glitter, in the phlanax of the Austrian School, and especially in Fredrich von Hayek and Ludwig von Mises, whose adherents were loud as the last century closed. One of the more curious things to happen was the collapse of the old currency, the Krone. 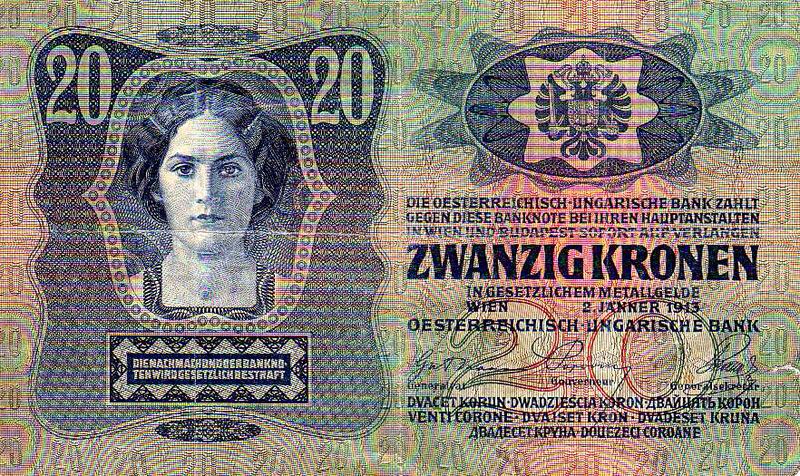 It appeared in its mummified form about 1892, when in an effort to wrestle the Empire into the future, the Austro-Hungarian finance ministry introduced the new notes to their grateful subjects. This little niblet, pictured here, may have passed paws in its life from Czech farmer to Vienesse kulturati to Ashkenai merchant or Hungarian miner. And it was a trusted currency, up until the 1910's, with a hard tie to gold. Indeed, the institutions of the Empire were so deep and respected that they still dominate the social structure of its previously subject nations. The 'Hapsburg Effect' has emerged as an explanation for this subtle tendency (worldwide). In the rocky road from Vienna to Brussels there is even a dim skeleton of the old Empire with a walk-on role. Otto von Hapsburg, the last Crown Prince of the Empire, and who died last year, acted as a bridge from turret to glass, and was a great believer in the EU as vague successor to his lost land. So perhaps the lesson is that unlikely groupings can endure for unusual lengths of time, that weird rituals and incomprehensible statutes can lead to a vague pride over the decades, even in the absense of logic, and that if an elite wills it for long enough, it really does take an unusual cataclysm to undo the castle. But this is a sample of one. The curious and lapping power of oil, and a new inter-Scandinavian migration. An update on Hedge fund value in 2012, with nary a reference to my take. Why do we clench our little fists? And finally, some photos to set standing in profile around the heart.